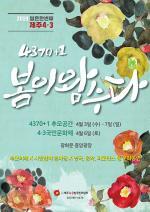 At the end of March, Dongmun Night Market officially opened. We went on the first Saturday after the opening to check out how things were getting on. What was immediately clear was that the market was incredibly popular. 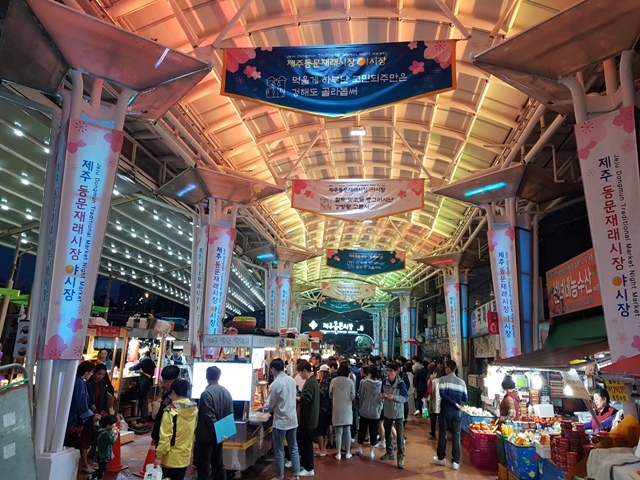 The nighttime food section is only a small part of the overall market but it seemed like everyone was heading towards the new area (It's also worth mentioning now that the raw fish restaurants at the market are also open at night and very popular). Upon arriving you will see that the night market itself is made up of two lines of food stalls. We didn’t count exactly how many there were exactly but there was certainly plenty of choices. Arriving at about 7 p.m. there were a lot of people and pretty much each of the stalls had a queue. The bustling feel and the crowds definitely gave the market a fun atmosphere and made you want to jump into choosing some food. That was where things began to tricky. As mentioned above there is a lot of choice at the market. 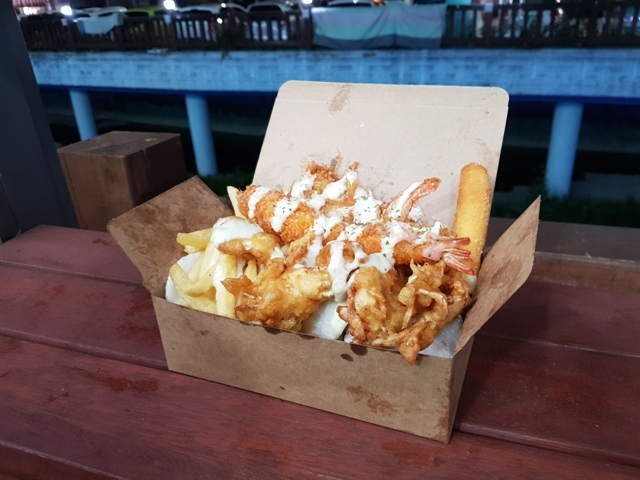 In fact, there were far too many stalls to list everything here but some of the highlights that stuck out in my memory were a kind of chopped-up steak, seafood and chips, abalone kimbab, kebab skewers, and nut ice cream from Udo. There were also plenty of more standard Korean staples such as kimbab, ddeokbokki, and deokgalbi. More seating would have been nice, but I guess it is a market, not a restaurant so perhaps not having quite enough seating isn’t too much of a problem. So, once you have chosen your food, queued up, and paid for it, you have to find somewhere to eat your meal. Considering the crowds, this was no mean feat. There was some seating around the edge of the market, although not much. We eventually found a spot standing at a bar-like table. 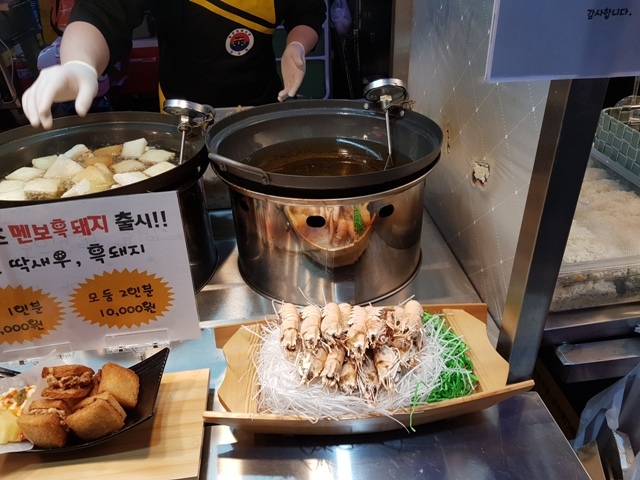 In terms of prices, everything was relatively cheap with most of the meals seemingly coming at somewhere between five and ten thousand won. We bought seafood and chips which was a steal at five thousand won. This was a selection of fish, mini-crab, shrimp, chips, and prawn crackers. It was served in a cardboard box with a mild wasabi based sauce. In terms of whether or not the food is any good, well, we couldn’t possibly answer that until we’ve been back a few times and tried some more of what is on offer. What I will say is that the seafood and chips we had was nice and a steal at five thousand won! Going into the future it will certainly be interesting to see how popular the market stays/becomes. When we went it was incredibly busy but it was also the first weekend after the official opening so perhaps that was to be expected. 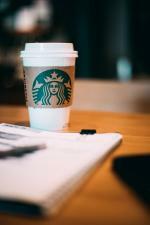 Although, having said that, the market had been open during the trial period for a few weeks prior. The market is also in a good location near to plenty of hotels so even if it doesn’t stay quite as popular with Jeju residents, I imagine there should be plenty of tourists who will keep on going. 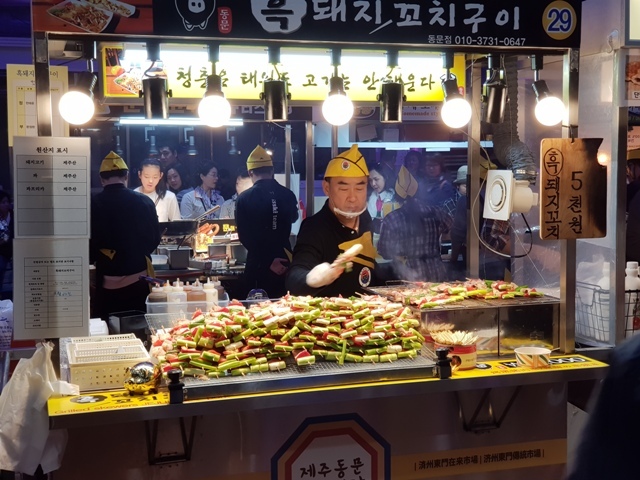 I certainly know that if it was me that was going on holiday, I would not be disappointed with a trip to Dongmun Night Market after a day at the beach or after hiking some Olle Trails. Where is Dongmun Night Market? 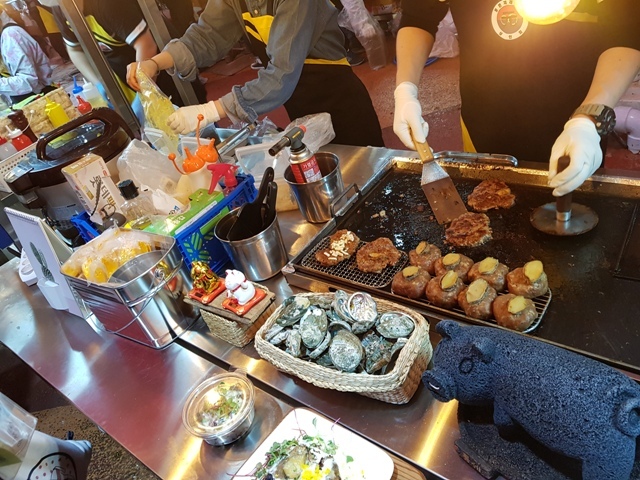 When is Dongmun Night Market open? The market is open every day from 6 p.m. until midnight. 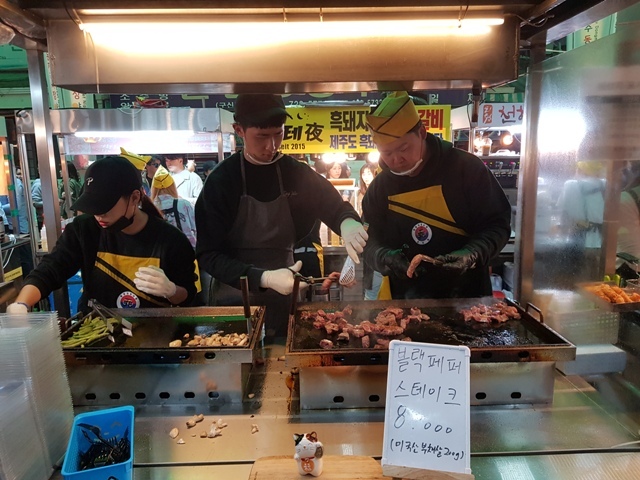 How much is food at Dongmun Night Market? The price is dependant on the specific meal, but most seemed to be between 5000 and 10,000 won. Not a bad price!